VIP Event Rent James Bond 007 Museet Bachelor party Open Daily 10 -17 (lunch 13-14) Sat 10.00-14.00 Sunday closed 1962-2012 50 years, 22 films. 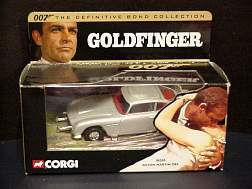 Superbly detailed 1:36 scale Corgi model car from Goldfinger. Complete with collectable new film packaging. Aston Martin DB5 (Goldfinger) The earliest of the Bond films represented in The definitive Bond Collection, Goldfinger was the third of 19, opening in London on th 17th September 1964. 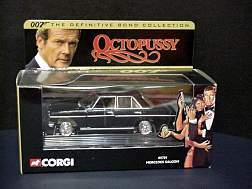 This 1:36 scale replica features plenty of Q's gadgetry as working features include ejector seat, machine guns and rear window bullet-proof screen. 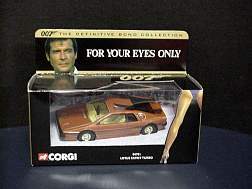 Superbly detailed 1:36 scale Corgi model car from For Your Eyes Only. starred Roger Moore with Cassandra Harris (Mrs Pierce Brosnan, who thus beat her husband into Bond) as a Bond girl and Charles Dance as one of the henchmen. Also starring was this punchy Lotus Esprit Turbo, complete with rear mounted detachable skis. New Release! 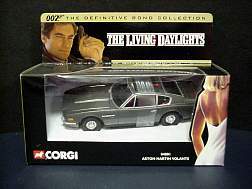 Superbly detailed 1:36 scale Corgi model car from The Living Daylights. Complete with collectable new film packaging. Aston Martin Volante (The Living Daylights) Timothy Dalton made his first appearance in 007 in 'The Living Daylights' , the 15th film in the Bond canon which premiered in the Uk on 29th June 1987. As part of his armoury against the baddies, the film included the original of this Volante, into which 'Q' mounted skis, reproduced here as working features for the first time. New Release! 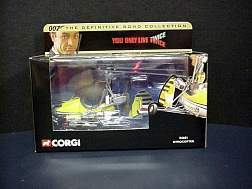 Superbly detailed 1:36 scale Corgi model from You Only Live Twice. which cost just$8.5 million to make - had taken a total of $111.6 million over its 32-year life. Our 1:36 scale replica's working feature applies to the forward mounted machine guns, with which Sean Connery and Donald Pleasance fought out a memorable duel. New Release! 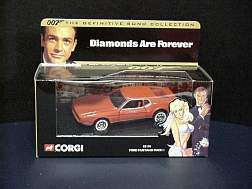 Jamesbond-shop.com är webbplatsen för dig som vill se www.007 museum.com och köpa James Bond 007 saker.